Do you have a property that is overgrown? Tractor slashing can take an impenetrable, overgrown disaster and turn it into an open, accessible and attractive green space. Our four wheel drive, large tractors can operate on steep slopes and hard to get areas. 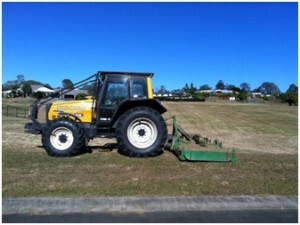 We have a range of slashers from high speed finishing decks for large parklands through to super heavy duty rough country slashers that can slash lantana, tree saplings and other heavy vegetation.We have a range of implements we can use including vegetation grabs to grab and remove vegetation, stick rakes, post hole borers, etc. Jungle Busters have extensive experience in roadside slashing, having slashed most of the major highways in South East Queensland and also extensive experience in parks and acreage slashing. Jungle Busters have been tractor slashing since 1992, starting in the Samford area and branching out into servicing all of the South East Queensland area. We are the experts in this field.